Kecy Metal Technologies (formerly Kecy Corporation) was established in 1988 as a supplier of NVH components for Tier 1 Japanese transplants. Kecy has since doubled its capacity to 160,000 ft² and consistently increased sales year over year. Kecy has expanded its customer base and product portfolio to include ride control and exhaust systems, fuel system tank floats, and several niche non-automotive applications. 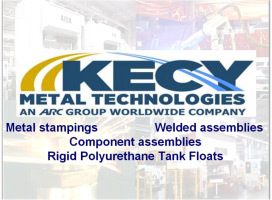 In June 2014, ARC Group Worldwide added Kecy Metal Technologies to their holistic approach to manufacturing. ARC’s entrepreneurial spirit promotes investing in the latest equipment for metal manufacturing and in their skilled team of associates to provide customers with quality products at a competitive price. Today, Kecy is still a leading manufacturer of precision metal stampings, robotic and resistance welding, component assemblies, and fuel system tank floats for the automotive industry. Kecy continues to use innovative manufacturing principles to maintain a competitive edge in today’s demanding market. Our wide range of press capabilities allows Kecy to deliver precision parts of various sizes and materials to a variety of industries. Through our secondary operations of welding, in-die staking, component assembly, and e-coat and plating capabilities, Kecy provides a value-added aspect for our customers who desire a line-side ready product for their operations. Please contact us to learn more about our manufacturing capabilities. We will grow our partnerships by delivering quality, on time, cost effective, manufacturing solutions utilizing technology, innovation, customer service, and teamwork.